Everyone knows that Clayton Kershaw is awesome. He’s 23 years old, throws in the mid-nineties and has a slider so breath-taking that even the McCourts can’t put a price on it. But did you know that he’s actually outhitting the competition this season? Kershaw has a .627 OPS as a hitter, while holding opponents to a .569 OPS. He’s one of three starting pitchers with at least 30 plate appearances who have fared better in the batter’s box than the opposition. Kershaw has done it by dominating on the mound and sprinkling in some singles as a hitter. Rotation mate Chad Billingsley (.855 OPS as a hitter, .749 as a pitcher) and Chicago’s Carlos Zambrano (.822 as a hitter, .725 as a pitcher), on the other hand, are swinging big bats but giving up plenty of hits as well. The hitting exploits of Kershaw, Billingsley and Big Z made me wonder: which pitchers, either by virtue of superb pitching and singles-hitting or so-so mound work and slugging, outhit the competition by the widest margin in a single season? – Don Newcombe slugged seven homers for the Brooklyn Dodgers in 1955, including four at Ebbets Field. The hulking Newcombe, listed during his playing days at 6-foot-4 and 225 pounds, threw righty but batted lefty. That couldn’t have hurt, considering Ebbets Field’s dimensions in ’55: 343 feet to left field, 393 to center and about 300 to right field. Newcombe was actually used as a pinch-hitter at times during his career and finished with an 85 OPS+. As our own Patrick Newman pointed out, Newcombe played as a first baseman and outfielder in 1962 for the Chunichi Dragons of Japan’s Nippon Professional Baseball. – Carl Scheib was the youngest player in AL history when he debuted at the age of 16 for the Philadelphia Athletics in 1943. He scarcely pitched in 1945 and didn’t pitch at all in 1946 while serving in the Army as WW II wrapped up, suffered a shoulder injury in the early 1950s and made his last big league appearance in 1954. He retired with a career 85 ERA+, but he flirted with a .400 average in 1951. – Seven of the guys in the top 10 had multiple seasons in which they outhit the competition. Rick Rhoden pulled off the feat five times (1976, 1980, 1982, 1984, 1986). Don Larsen and Warren Spahn each did it on four occasions, and strangely, in the exact same years (1953, 1956, 1958, 1961). Newcombe (1955, 1956, 1959), Micah Owings (2007-2009) and Carlos Zambrano (2005, 2008, 2009) outhit opponents three times. Zambrano also holds to all-time record for bats snapped like a cheap No. 2 pencil after striking out. Don Drysdale (1958, 1965) did it twice. – Mike Hampton’s line as a Colorado Rockie in 2001 and 2002: .315/.329/.552, 10 home runs. I know it’s Coors, but that was still good for a 109 OPS+. If only the whole, you know, pitching thing had worked out. – Micah Owings‘ career line as a hitter: .288/.317/.524. 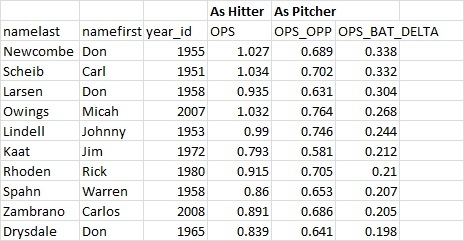 According to Baseball-Reference, Owings’ 112 OPS+ as a batter is actually the best mark ever among pitchers with at least 200 career plate appearances (minimum 70% of career games as a pitcher; otherwise, Ruth wins in a landslide). As a pitcher, Owings has allowed a .256/.342/.425 line. Brooks Kieschnick says hi. We hoped you liked reading Pitchers Outhitting the Competition by David Golebiewski! +1 for Kieschnick reference. 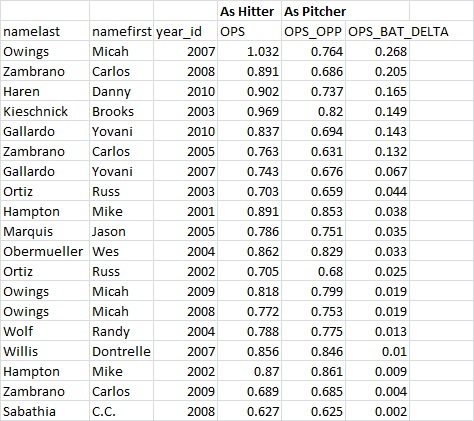 Mobile, so without access to stats, I’m surprised Andy Benes didn’t make the list. I’m also pretty sure I have a Mike Hampton baseball card somewhere where the photo is him batting.